Accommodation in Morocco is something that will not trouble you much, as there are hotels and Riads for all tastes and budgets. The growth of the tourism industry in the country “brings” ever more accommodation options. Big companies invest in new hotels or renovate former villas and offer quality accommodation in reasonable prices. But there are also plenty of individual citizens who utilize their abandoned houses and transform them into beautiful Riads of 3-5 rooms! In Morocco’s Medinas you will not find hotels and tourist resorts, as the densely-populated urban networks are not subject to changes. Inside the walls there is only space for Riads. 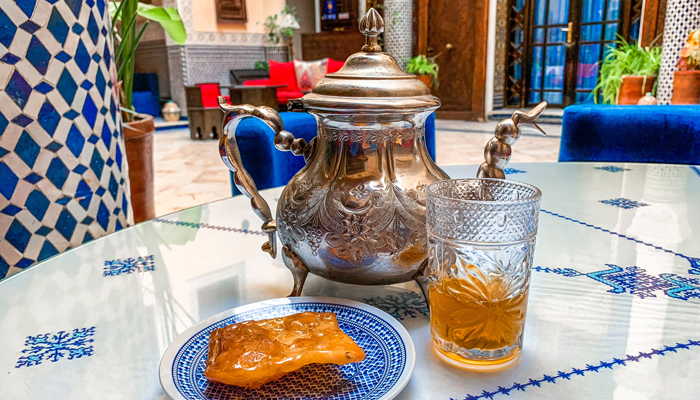 The experience of staying at a Riad give you a taste of how the locals live. Most Riads, of course, have been upgraded and provide multi-star services. Outside the walls you will find many hotels with much lower pricesς. The average price for an overnight stay in Morocco is 80€. Prices, of course, differ from city to city. In tourist-oriented Marrakech they are higher than in Rabat. In Fez and Eshawira, on the other hand, they are reasonable, but options are both limited and of lower quality compared to the ones in Marrakech! Also, we must mention that almost all of the hotels and Riads in Morocco offer rich, local breakfast for free. Hotel Tips Morocco: a) If you stay at a Riad inside the walls of the Medina, make sure the Riad is close to the walls. Otherwise you will get lost…Medinas are labyrinths! b) Pay via card at the accommodation site and ask to withdraw the amount in Dirhams and not in Euros! (you will gain in terms of exchange, while you will not pay for commission) c) If you stay at a Riad, make sure you book a room on an upper floor. Ground floor rooms are very noisy and damp! d) Riads are houses of locals, which have at their center a square uncovered yard (patio). Over there, families gather (usually women and children) for food, to share the news of the day as well as to relax, away from people’s looks! e) Most accommodation sites are located inside the Medinas (70-30 ratio). 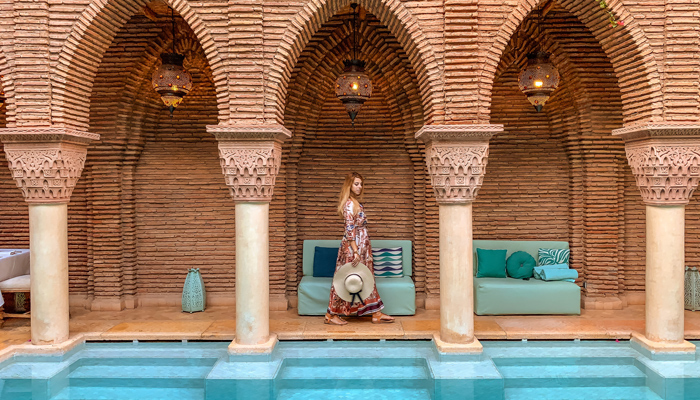 La Sultana Marrakech is an attraction not only for Marrakech but for the entire Morocco! 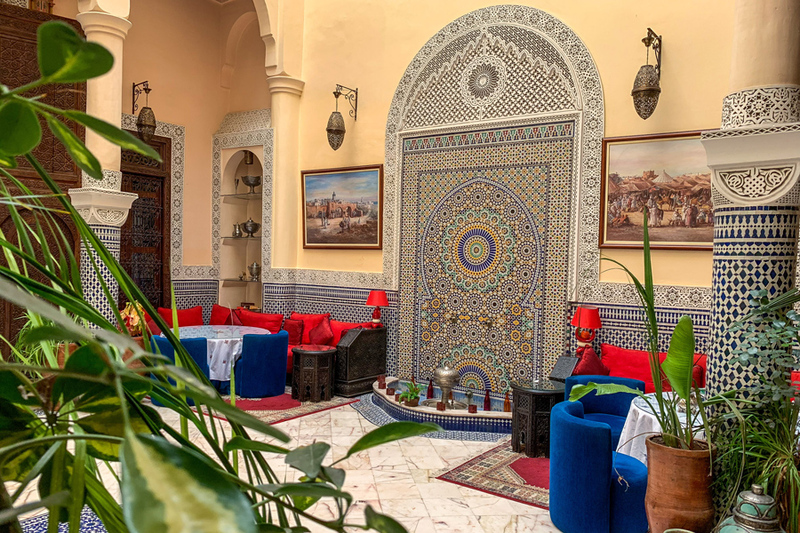 It is a complex of five different Riads that are connected in a harmonious way and offer five-star accommodation! The hotel is located close to walls of the Medina in a busy and safe neighborhood, just 10 minutes away from the Jemaa el-Fnaa Square. It has direct access to the Souks of the Medina, the Saadian Tombs, the Moulay El-Yazid Mosque and the taxi rank. On the inside, the riads are clean and decorated with modern touches, antiques and oriental furniture. 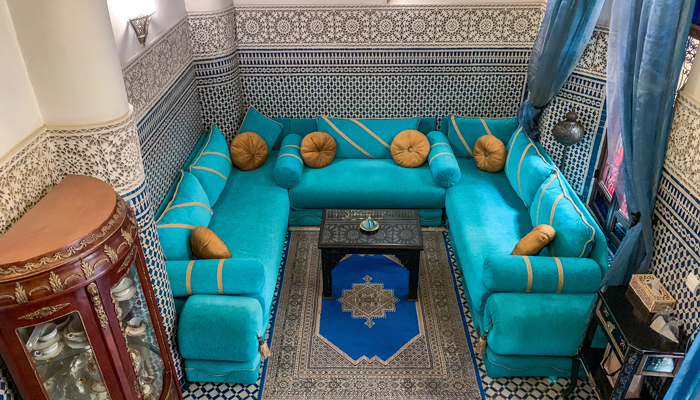 The style of each Riad is different and mesmerizes the visitor with its vivid personality. 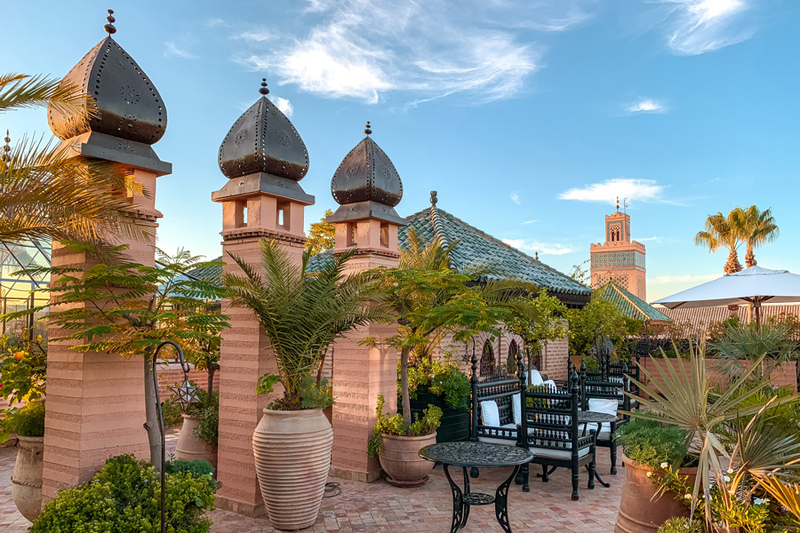 A special mention is due for the top floor of La Sultana Marrakech, where the rooftops of the five Riads are spread across a unified area of 1,800m² (!). From up there you have a 360° panoramic view with the most major points of interest being the Koutoubia Mosque, the Saadian Tombs, the colorful shops and, of course, the snow-clad mountaintops of Mount Atlas (during the winter months). The staff is very polite and willing to help you 24/7. In the hotel you will find a spa, turkish bath/steam room, Jacuzzi, beauty center, a library, organized conference facilities, a gym, gift/variety shop, as well as the much-photographed indoor pool. 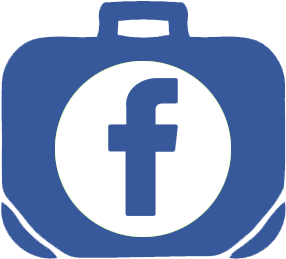 Also, it offers transport service from and to the airport, while all areas have free wifi. 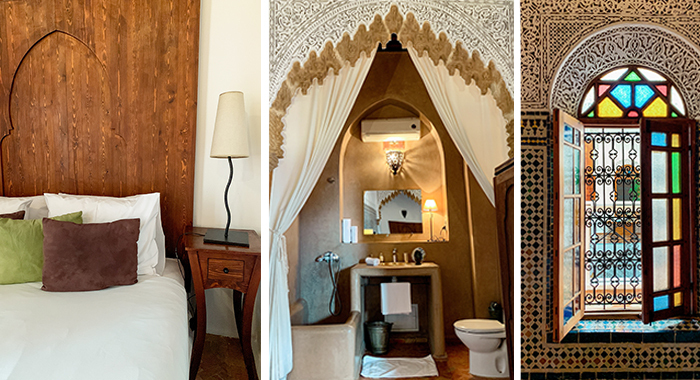 The 28 boutique rooms of La Sultana Marrakech are styled differently, with decor that takes the visitor on a journey through the Mauritanian tradition. Comfortable (the smallest one starts at 30m²), clean and with oriental/friendly luxury that you do not come across easily, the rooms will keep you inside for many hours. The nice smells, cozy fireplace and excellent soundproofing are only a few of the elements you will find while entering the room. Other amenities include a work desk, sitting area, mini bar with free soft drinks, the comfy king-size bed, air-conditioning, iPod base, TV and more. The luxury, mosaic bathroom has a bathtub and shower with free beauty products, slippers and bathrobes being a few more of its amenities. 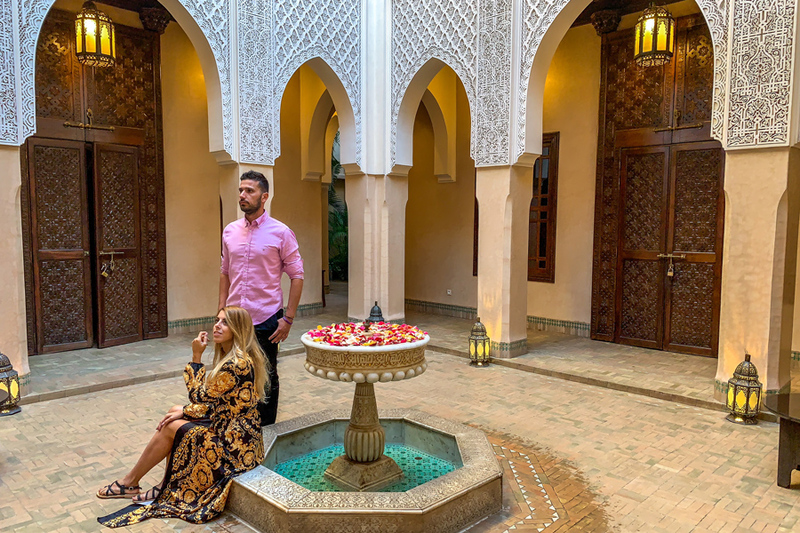 At La Sultana Marrakech the cost per night starts at 400€, a price that totally reflects the experience that the five-star luxury hotel offers. Breakfast is included in the price and has many options, which are of the highest quality! 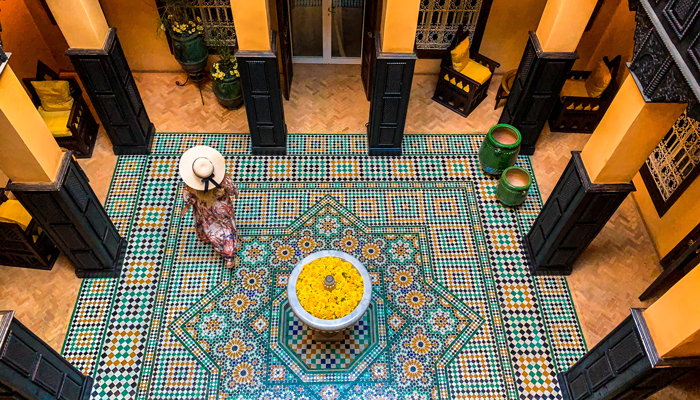 Riad dar Soufa is a hidden gem in the heart of Rabat. It may not have a big number of rooms, but it offers family hospitality and a pleasant, friendly environment. It is located in Rabat’s Medina, in short distance from its walls. The area around the hotel is safe, while in the afternoon it is transformed into a fair with dozens of street sellers setting up their stands in front of it. Also, the heart of the city’s street food scene beats at a very short distance! On the inside it is well-maintained with simple and wonderful Moroccan décor. 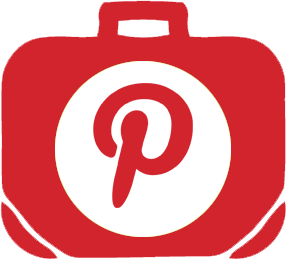 Cleanliness and attentiveness are two extra positive elements that make the visitor’s stay even more pleasant. On the ground floor you can take your breakfast, in the sitting area of the first floor you can have some coffee and relax and on the rooftop you can sunbathe and enjoy the view. Riad dar soufa offers free wifi in all areas, while its five rooms (1 family and 4 double) create a more familiar and warm environment. The rooms are spacious, bright and very functional. Cleanliness is at high levels and benefits are totally satisfactory. 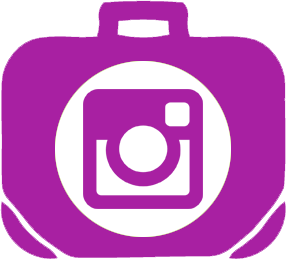 Among them we find air-conditioning, free beauty products, a safe box, comfortable double bed, hair-dryer and more. Furthermore, the décor follows beautiful Moroccan lines and impresses with its simplicity and attitude. The bathroom is very clean and has a brick and mortar shower and plenty of hot water. The cost is around 70€ per night, a price which is perfectly reasonable considering both the quality and benefits it offers. The price includes a nice breakfast. Riad Kniza is located in the anti-tourist neighborhood of Bab Doukala in Marrakech, in an exquisite 18th-century Moroccan building. Access can be achieved only on foot, as it is inside the walls of the Medina, while around the hotel the dozens of small shops with food, clothes, antiques and Moroccan products bring life from early in the morning until late at night. Within a short distance from the Riad is the Gueliz Mosque and the heart of the new Marrakech, the Gueliz Square. 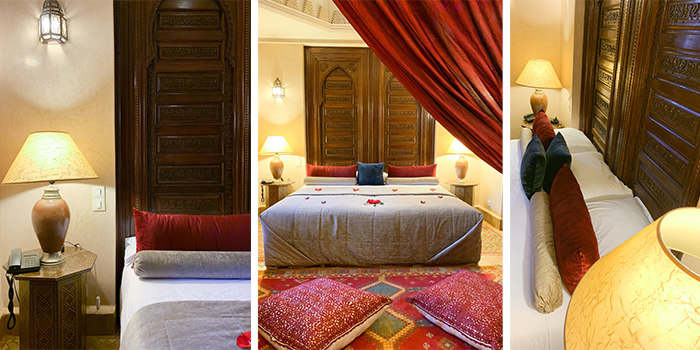 The 4-star Riad is the offspring of one of the biggest retailers of rare items in Marrakech. Haj Mohammed has hosted/guided former presidents of the United States and great names of the global art industry, such as Brad Pitt, Tom Cruise, Nicole Kidman and more. Its interior decoration is purely Moroccan with carved furniture, artworks and antiques. The staff is pleasant and ready to help you 24/7, while all areas are clean, bright and offer free wifi. 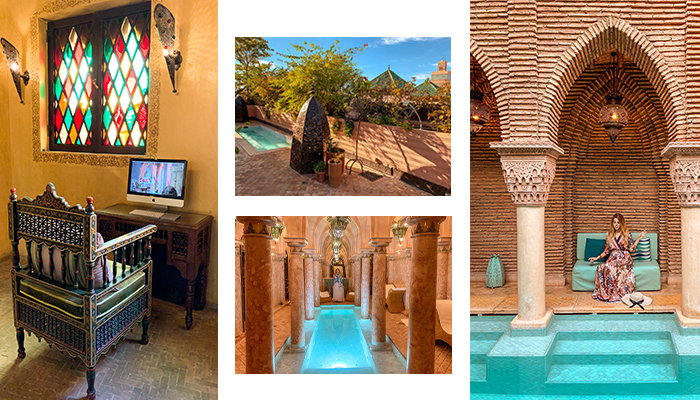 At the Riad Kniza you will find plenty of spaces for relaxation, a library, spa and pool. Also, its rooftop is another place for you to relax, take your breakfast or sunbathe. The hotel provides transport service from and to the airport of Marrakech, as well as left luggage service. 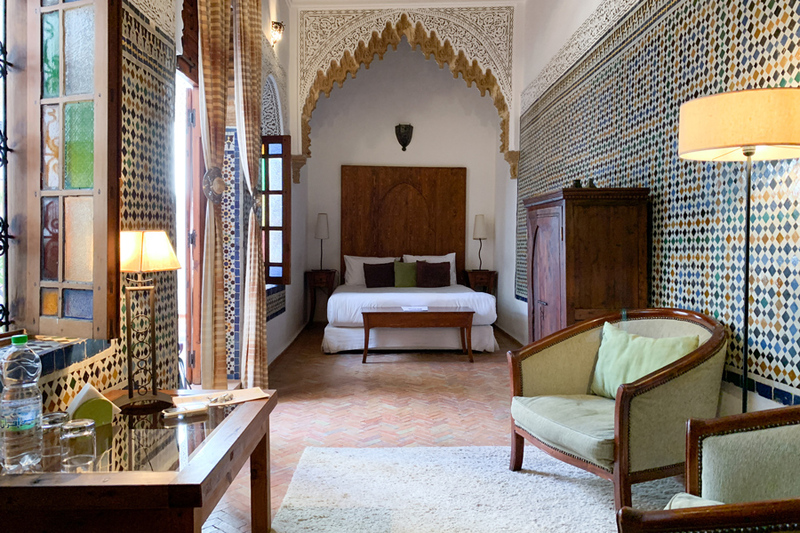 The 11 rooms & suites are very comfortable (the smallest one is 32m²), functional and dressed in traditional Moroccan style. The pronounced Moroccan décor will make you feel special from the very first moment that you enter the room. The functionality of each space, excellent soundproofing and cleanliness are only a few of the elements that will make your life easier. In the room you will also find a work desk, air-conditioning, TV, a fireplace, safe box, sitting area, free wifi and many more. Its bathroom is also very clean and offers free beauty products, a bathrobe, slippers and it has warm water throughout the whole day and night. The cost per night starts at 200€, including a very good breakfast. The price is totally reasonable for the quality and its benefits. 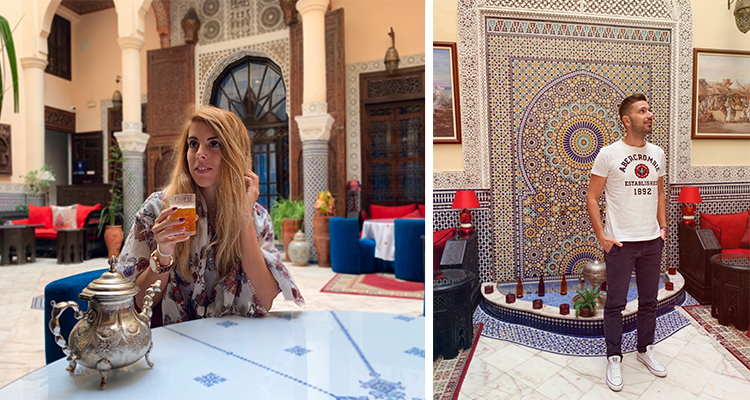 Riad Kniza offers an experience of Moroccan accommodation with the luxury and finesse that befit aristocratic Riads, like this one. Tip: When the taxi drops you off at the start of the Medina, many people will come for “help”. Ignore and keep going…Riad Kniza is located on the first street on the right (3-minute walk – there is a sign on the corner). 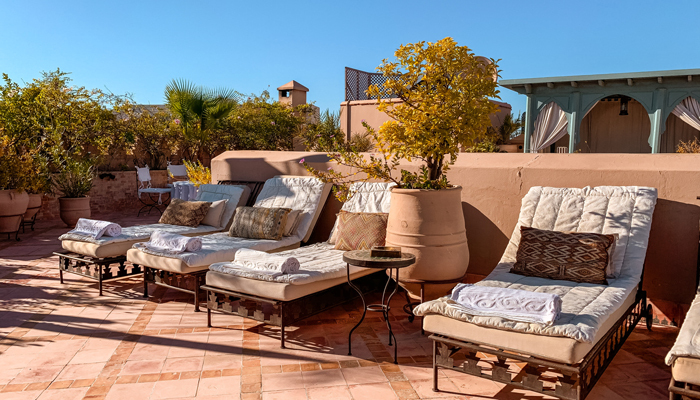 If you want an affordable stay in Marrakech, then Riad Du Petit Prince is a good option. It is located on a small street in the Medina of Marrakech, just 4 minutes away from the central street. The area around the Riad has dozens of small shops (mostly for food products), while you should avoid returning in the evening, after the shops have closed. The Majorelle Gardens, as well as the new Marrakech is within a short distance from the accommodation site, which has also easy access from the airport. 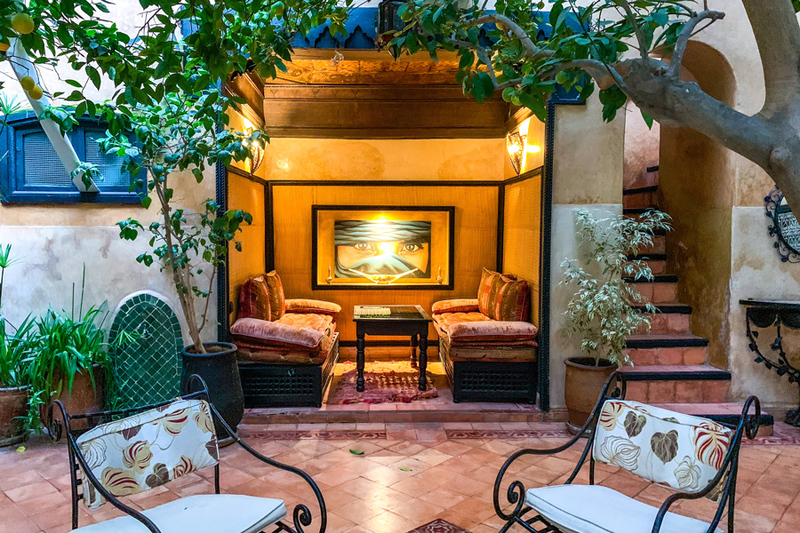 On the inside, the Riad Du Petit Prince is pretty, clean and has simple Moroccan decoration. Its staff is attentive, but they are not there 24/7 in order to cover any need that might come up. On the ground floor you will find the breakfast area, an indoor rest area, the outdoor pool with free access, as well as spots around it where you can relax and drink your tea. In all areas as well as inside the rooms there is free wifi. 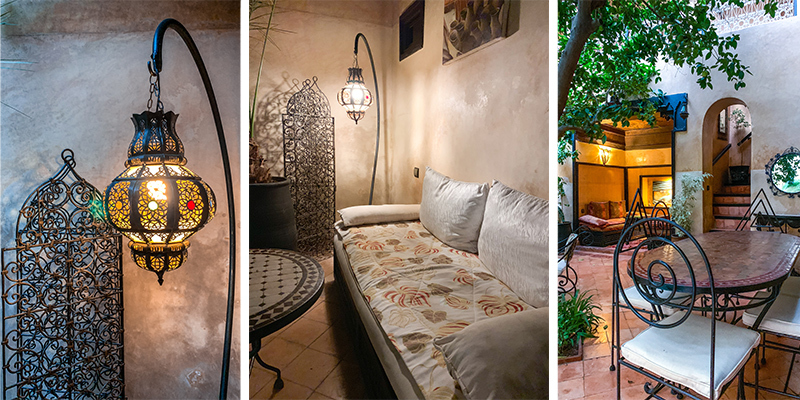 The Riad Du Petit Prince has only four rooms, which are satisfying. 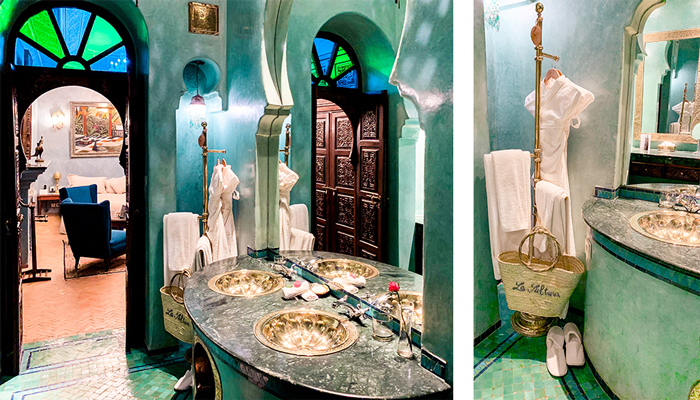 Its interior is limited in space and dressed in a quite heavy Moroccan décor. Among the room’s amenities we find heating, air-conditioning, a couch, beauty products, clothes iron and the view of the outdoor pool. 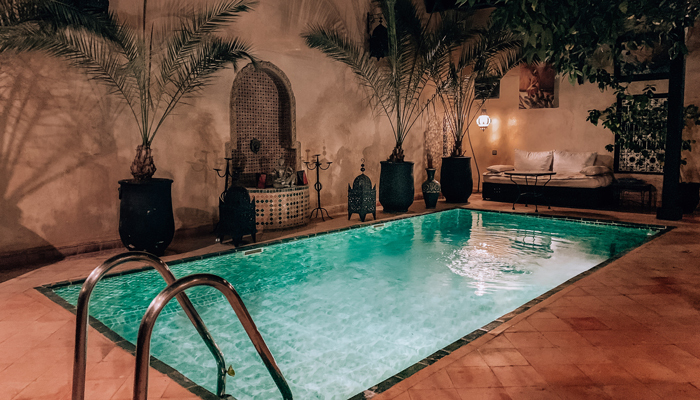 The cost per night is around 50€ including breakfast, a price that is pretty enticing for whoever wants an affordable stay in Marrakech, with limited demands. 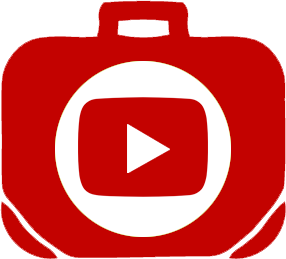 Tip (very important): The Google mark is wrong, therefore you cannot find it! For this reason, before you enter the Medina make a call to the Riad so that someone comes to pick you up! 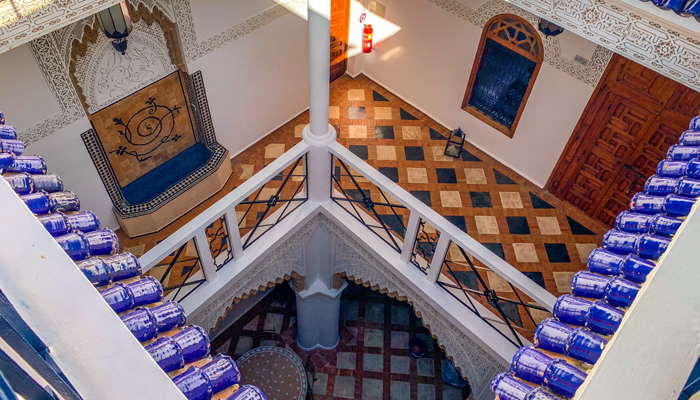 The Riad IBN Battouta is located outside the Medina of Fez, but offers easy and quick access to it. The area around the hotel is pretty safe, while at a 50m distance you can find the central street that leads to the new city of Fez. 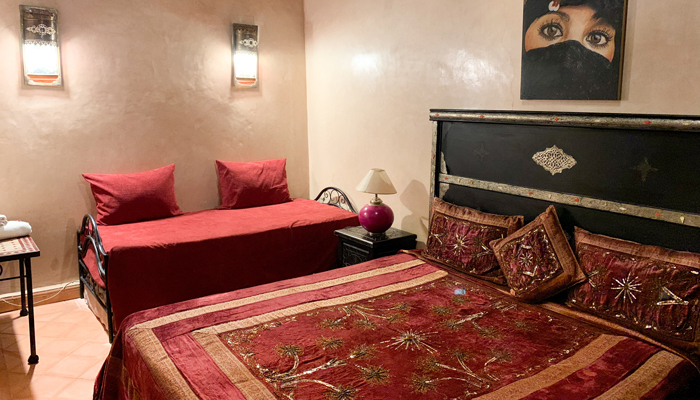 At a 100m distance from the Riad there is an outdoor parking and a taxi rank, so that you can be transported easily and at a low cost to any location in the city you want. The Riad is a building quite tall and has a private entryway. At its center there is a large and bright patio, where you can have your breakfast or relax throughout the whole day. 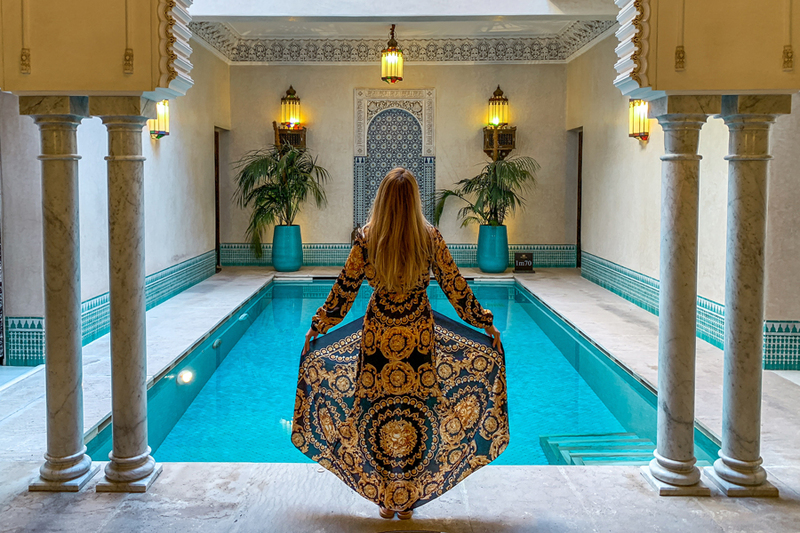 The traditional Turkish bath, massage room, free wifi and comfortable couches of the ground floor are a few of the elements you will find at the Riad IBN Battouta. 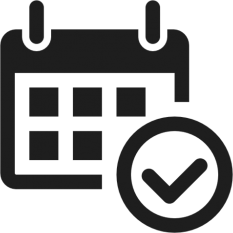 The staff is pretty attentive and willing to help with any problem, on any hour of day and night. Each one of the seven rooms is another theme from the life of the famous traveler IBN Battouta. They blend elements from the east and the west, thus offering a unique note during your stay in Fez. The rooms are spacious, with limited lighting and quite a bit of dampness. Furthermore, among their amenities we find a sitting area, air-conditioning, a safe box, TV, closet, free wifi and more. 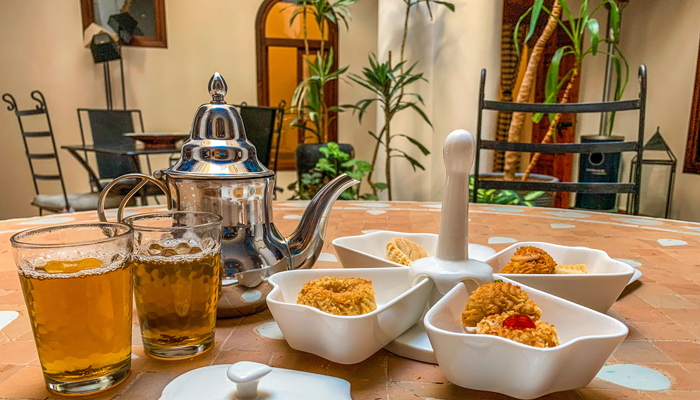 The cost per night is 80€ including a –poor- breakfast, a price which is decent for everything the Riad IBN Battouta offers. a) Book a room on one of the upper floors. Do not opt for the large room of the ground floor, as it is very noisy and damp. b) Amenities mentioned on various websites are not real! 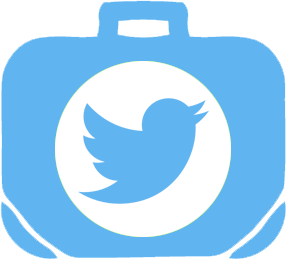 Scores, opinions and reviews about accommodations are completely subjective, but fully capture everything we saw and experienced without any preconception, affinity or distaste. Also, prices may vary depending on time period and demand.